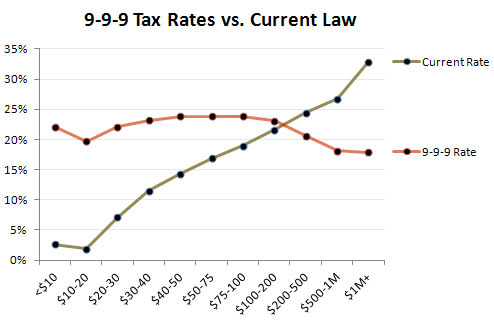 The Tax Policy Center has done yet another analysis of Herman Cain’s 9-9-9 plan, and guess what? Unless you’re really rich, your taxes will go up! If you earn, say, $50,000 per year, you currently pay about 14.3% of your income in federal taxes. Under Cain’s plan, you’ll pay 23.8%. Whee! And if you make the big bucks? Well, millionaires currently pay about 32.9% of their income in federal taxes. Under Cain’s plan, they’ll pay 17.9%. Ka-ching! UPDATE: Yep, Cain’s answer was “They’re wrong,” almost verbatim. Plus some more nonsense about apples and oranges.